Over the years I’ve shared at least three different pumpkin bread recipes on my blog. (Maybe more, but I can only locate three.) Based on a brief search I found Spiced Pumpkin Bread from September 2014, Buttermilk Pumpkin Bread from October 2015, and the first pumpkin bread recipe I ever tried, Taste of Home’s Delicious Pumpkin Bread, that I finally posted in September 2016. It’s one of my favorite seasonal treats, and most years I’m eagerly awaiting the arrival of September so I can crack open my first can of pumpkin of the fall. Of course, this year is a little different. Until today I hadn’t done any holiday baking due to being on whatever you want to call this diet, and with as much as I love the holidays it’s been a real struggle. But when I found out that my Galloway running group was having an end of the season breakfast tomorrow morning I saw a golden opportunity. I could have the enjoyable experience of baking pumpkin bread without eating it! Genius! I took the day off from work today for a few reasons, one of which being that I didn’t want to stay up late tonight making the pumpkin bread for tomorrow. Even with almost the whole day to work with, the process still look twice as long as it should have due to an error on my part. 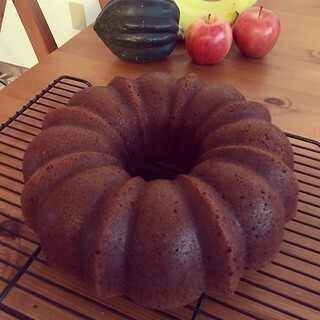 I was watching a Mystery Science Theater 3000 movie while I was baking and I guess I got a little distracted because I completely forgot to grease the bundt pan before pouring in the pumpkin bread batter! I realized this omission when the cake didn’t easily release from the pan after it was done baking. I tried to salvage it, but the poor thing looked like it had exploded. Boy did I feel stupid. While the bundt pan was soaking in the sink to remove all of crumbs that were stuck to it like glue, I wallowed a little by cramming several small pieces of the destroyed cake into my mouth. Not a diet-approved snack, but it was so delicious. Luckily I had enough time and extra ingredients to make a second batch of pumpkin bread, this time liberally greasing the pan before baking. And as you can see in the above picture, the second time was the charm. My running group is going to eat well tomorrow!